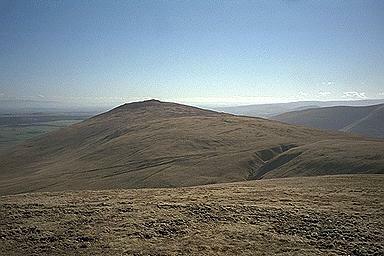 The walk from Carrock Fell to High Pike consists of gradual slopes typical of this area of the Northern Fells, and provides easy walking. The greatest hazard is being hit by a FWD. The eastern slopes of Bowscale Fell appear on the right with Barton Fell and Loadpot Hill beyond. There's a trace there of Little Mell Fell in the middle distance. Larger version of this picture.